The twelve regular meridians form the backbone of the meridian system; they are located at a certain depth and run straight fixed coursesthrough the body. Each of them has branching collaterals that run crisscross to further connect and network the entire body. There are innumerable minute or fine collaterals distribute inside the body, they construct a detail network system for transporting and nourishing the tissues. Below are important ones for clinical applications. These are formed by a larger branch of each of the twelve regular meridians, the Governor Vessel and Conception Vessel as well as an extra collateral of the spleen meridian. The connecting collaterals run along the limbs and on the trunk, they will connect to their corresponding meridians so as to build up the so called "interior and exterior relationship". Physiologically, they enhance communication between the meridians; the connecting collateral of the Governor Vessel promotes the meridian flow in the back; the connecting collateral of Conception Vessel promotes the meridian flow in the abdomen; the extra collateral of the spleen meridian regulate the meridian flow in the bilateral sides of chest. The areas for branching off these collaterals are called "connecting points", stimulating on them can have special therapeutic effects. The twelve regular meridians branches out these collaterals to help them penetrate into deeper parts of the body. Most of these collaterals derive from their main meridians near the elbow or knee regions, they run into the chest and abdomen cavities, connect with their corresponding internal organs, and then emerge back to the body surface in the head and neck regions. The twelve divergent collaterals combine the meridians and organs together, and bring all parts of the body closer, which extend the therapeutic range of certain acupoints. For example, the yin meridians do not normally run to the head region, but the divergent collaterals make them connect to the yang meridians, thus for some problems in the region such as headache and migraine, acupoints (Lu7 & Lu9) on the lung meridian are selected; while acupoints (Ki3, Ki6) on the kidney meridian are selected for toothache and throat conditions. These collaterals are the pathways which distribute the qi of the twelve regular meridians to the muscles, tendons and joints. They are regarded as the external connecting regions of the regular meridians. All the collaterals start from the distal part of the limbs, travel along the body surface, connect with the joints and bones, and end at the head and trunk regions. They monitor the bones and promote joint mobility so as to maintain normal physical movement. These refer to the skin segments on which the functions of the twelve regular meridians reflect on the superficial body, and the site where qi of the collaterals spread and gather. Since they are located on the most superficial part of the body, they also serve to protect against external invasion. Clinically, any abnormal signs on the skin segment help to diagnosis particular organ disharmonies; other therapies like hot compresses, dressings and moxibustion can also be based on this principle. 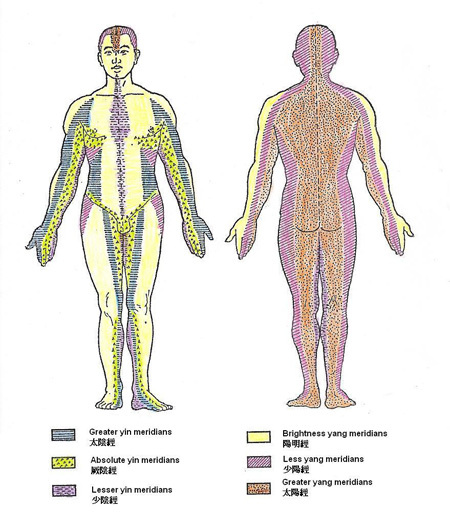 Skin segments dominated by the yin and yang meridians.